Fresh off Wall Street's worst week in four years -- one that saw the Dow Jones industrial average lose 10 percent of its value and the Standard & Poor's 500 index slip below the magical 2,000 barrier -- financial advisers have two words of advice for gun-shy investors. Sure, last week may have felt like a calamity if you were watching your portfolio shrink by the hour. But there were tell-tale signs -- after riding an extraordinary bullish market since 2009, Wall Street had been essentially trading sideways until this month. Then the market's softening became a full-blown meltdown Thursday and Friday. Wall Street's darling stocks -- the tech sector -- were among the hardest hit. Netflix (NFLX) lost nearly 16 percent; Apple (AAPL) and Facebook (FB) were both down nearly 9 percent and Microsoft (MSFT) fell 7.7 percent. Banking stocks were also horrid, as Bank of America (BAC) fell 9 percent, JPMorgan Chase (JPM) fell 6.3 percent and Wells Fargo (WFC) -- arguably the best banking stock of 2015 -- dropped nearly 6 percent for the week. Meanwhile, crude oil fell below $40 a barrel for the first time since 2009, and the CBOE Volatility Index -- the so-called "fear index" -- jumped more than 45 percent Friday and more than 90 percent for the week. 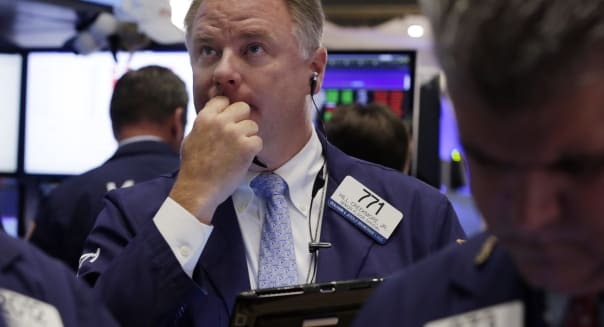 Matthew Tuttle, CEO of Tuttle Tactical Management in Stamford, Connecticut, says the S&P 500 is in a critical area of technical support. "We believe the bull market will end in 2016 or 2017 and believe we need one more rally to the upside before the market crashes, so unless we see the S&P go into the 1,700s, we would use weakness as a buying opportunity. Now, more than ever, investors should be in tactical investments that can shift out of the market if this is the end of the bull market, but that can stay invested if it is not." Like Tuttle, financial advisers say the recent weakness in the stock market isn't a reason to abandon stocks in favor of greener -- or less volatile -- pastures. Instead, it's an opportunity to reassess holdings, particularly for investors who are taking a long-term approach. Steve Sanduski, president of Belay Advisor in Mequon, Wisconsin, says the biggest mistake investors can make is fleeing the market at the wrong time. He says investors should hold tight, but he recommends a diversified portfolio that contains low-cost investments and a time horizon of at least 10 years. "On a regular basis, do the best you can at estimating your 'sleep allocation,' meaning, what's the allocation among stocks, bonds and cash that allows you to sleep comfortably at night," he says. "If the thought of a certain percentage drop in your portfolio makes you break out in a cold sweat, it's time to dial down the risk." Andrew Carrillo, president of Barnett Capital Advisors in Miami, also recommends the diversification approach. "What exactly investors should do depends on their time frame, risk tolerance and their ability to be nimble in their investing, but based on valuations, there is much more downside over the next year to the market than upside at current bubble territory." Sam Seiden, chief education officer for the Online Trading Academy, says investors can expect more downside in the short term. "The major problem for investors is that they think like average investors and not like Wall Street pros, and let themselves get into these risky situations to begin with, which are certainly avoidable," Seiden says. "There are plenty of simple things the average investor can do to not only protect themselves, but also profit when markets decline just like Wall Street does." For example, short-term investors can move funds into safe high-yield corporate bonds, where they will receive interest. "Then, use the interest to participate in market moves without any market risk to your principle," Seiden says. "This is one of many simple strategies Wall Street uses that the average investor can use also. The key is to stop thinking like a retail investor and start thinking like Wall Street with your hard-earned money." Long-term investors, meanwhile, should look for opportunities to buy cheap stocks and rebalance their portfolio. And they should have the assistance of a financial planner to help them, says Bill Keen, founder and CEO of Keen Wealth Advisors in Overland Park, Kansas. "Success in long-term investing is about thinking ahead and not being caught off guard by the inevitable market corrections when they come," Keen says. "We spend a lot of time providing perspective to our clients -- talking about the expected volatility of various asset classes. Long-term perspective is something that investors are in desperate need of."